The pain of sciatica can be anywhere from mild to severe and is quite unpleasant. It is most often due to pressure being put on the sciatic nerve that travels from the lumbar spine through the buttocks and branches off into each leg. What are some common symptoms one experiences with sciatica? 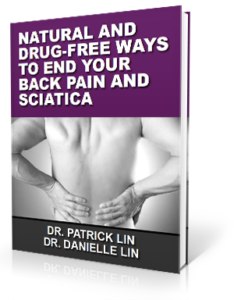 To learn more about the connection between head and neck injuries and back pain download our complimentary e-book Natural and Drug-Free Ways to End Your Back Pain and Sciatica by clicking the image below. While these have been shown to provide temporary relief, they are accompanied by harmful side effects, and they do not address the underlying cause of sciatica. Therefore, it is likely to return. A connection has been noted by professionals between improper spinal alignment and the pain of sciatica. Having the spine in optimum working order is a must to avoid sciatica and other health problems related to bad posture. How Does NUCCA Help Sciatica? One may wonder why correcting the bones of the neck can lead to healing in the lower back. This is due to the fact that it only takes a misalignment of ¼ of a millimeter in one of the top two bones of the neck to wreak havoc on the entire spine. The rest of the spine must compensate for this misalignment. That means the spine may move out of alignment and create pressure on the sciatic nerve. Here at Symmetry Health Chiropractic, we use a gentle method to help the bones move back into place. The body can then begin to repair the damage, and many patients report seeing improvement in their sciatica.